Your adoption helps support our work to ensure that these icons of the Salish Sea are protected by addressing the three major threats to their survival: prey availability, toxic pollution, and noise disturbance. 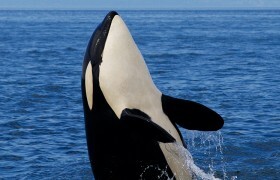 The orca, or "killer whale," is a toothed whale and is the largest member of the dolphin family. They are highly social and their family groups are lead by matriarchs. The Pacific Northwest is home to the most endangered orca population in the world: southern resident orcas. There are only 74 southern resident orcas left in the wild because of declining prey, toxic pollution, and noise disturbance. The Pacific Northwest is home to the most endangered orca population in the world: southern resident orcas. There are only 74 of these genetically distinct orcas left in the wild because of declining prey, toxic pollution, and noise disturbance. Southern resident orcas may disappear within decades unless action is taken. Your adoption helps support our work to ensure that these icons of the Salish Sea are protected by addressing the three major threats to their survival: prey availability, toxic pollution, and noise disturbance. We work closely with a coalition of local and national environmental groups, scientists, government agencies, and community members to protect these unique orcas.